Nutter Mummies - decorate Nutter Butters to look like mummies! So much fun for Halloween!! I usually make Nutter Butter Ghosts at Halloween, but this year I decided to add an extra step and make Nutter Mummies! 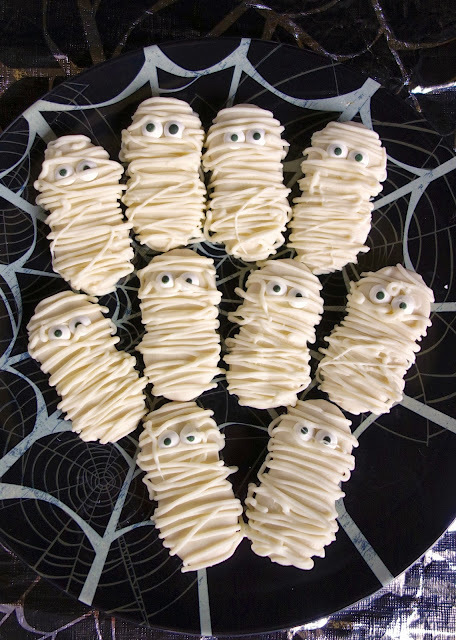 Aren't these the cutest mummies ever?!?! I think they are super cute! These would be the perfect addition to your Halloween festivities! 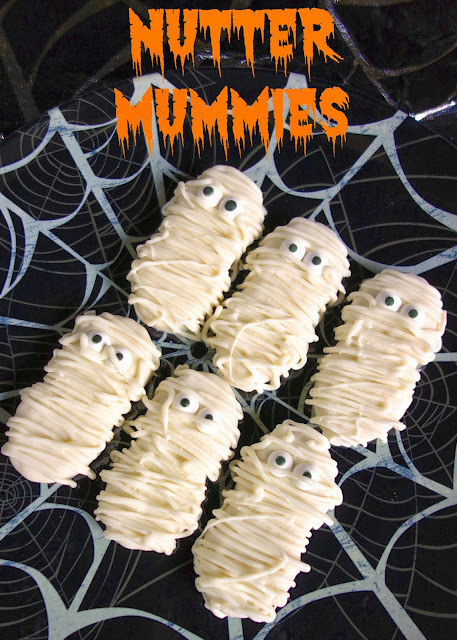 The best part about these mummies is that they are really easy to make. I used candy eyes from Wilton. I found them at Michael's and Wal-Mart. If you can't find the candy eyes, or just don't want to buy them, you could use some mini chocolate chips for the eyes. I love this recipe because you can make as many or as few as you like. The almond bark will keep and reheat well if you want to make these over multiple days. Melt almond bark according to the package directions. Dip Nutter Butters in the almond bark, shake off excess almond bark. Place on wax paper and attach eyes. Repeat with remaining Nutter Butters. Allow to set up. Reheat leftover almond bark and pour into squeeze bottle. Drizzle almond bark onto Nutter Butters to make mummy. Well these are too easy and too cute NOT to make! My kids could do the eyes! I am pinning this idea! you can use melted chocolate chips. I find the candy melts are much easier to work with. You are a genius, how cute are these! Too cute! Love them, and there's not even any baking involved. :) These are good candidates for treats for my kids at school. But what's even cuter is the name of your blog! Thanks Ali! You could do this with oreos. It would be just as cute.